I was honored to see that my image, End of the Road was featured on-line at See More http://bit.ly/r1w8GN. The image itself will probably be on the second or third scrolled page by the time of this post. Had I known it was included on this site earlier, I would have bragged about it sooner. Along with the work of some contemporary photographers, See More features truly classic and historic images as seen in LIFE or at the Museum of Modern Art (MOMA) in NYC. To be featured with some of the absolute masters of photographic history such as Henri Cartier-Bresson, Brassaï, Willy Ronis, Robert Doisneau, Irving Penn, Elliott Erwitt, Eve Arnold and Ruth Bernhard, is a privilege, to say the least. The story behind this particular image is worth telling. Driving home from Key West we were caught in a torrential downpour. The road through the Florida Keys is primarily one lane north and one lane south, surrounded by water on both sides. 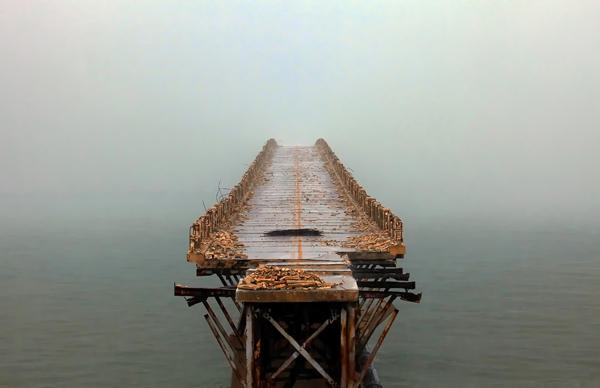 The storm created a virtual whiteout and as we drove past the remains of the old Bahia Honda Bridge it seemed to disappear into the fog. This was an ethereal scene, just begging to be memorialized. Concerned more about creating a classic image than my personal safety, I pulled over, covered my camera equipment and headed toward the bridge. Having just reached the shoreline that formerly led to the bridge, a deafening crack of thunder erupted, seemingly shaking the earth around me. I set up as quickly as possible, captured my image and then hightailed it back to the car soaked to the bone and glad to be alive. Although I would not recommend taking a similar chance to anyone, the resulting image has been very well received. Ultimately worth the effort and the risk, it actually turned out to be…a bridge to somewhere.